Hao Shuan Enterprise Co., Ltd.
1. 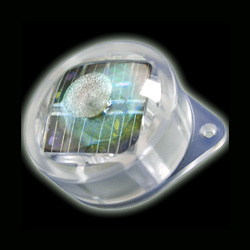 Mutli crystal solar with bright LED. 2. Flashing automatically & continuously in night. 3. 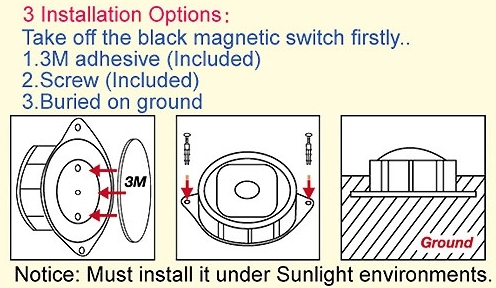 Collect sun power into the solar LED in sunshine day. 4. Charging 3~5 hours can maintain around 70 hours. 6. Easy InstallUsing PCMCIA Slot for internal power. 4. Anywhere you would like to catch someone's attention. 1. Electrical: (1) Solar panel: a. Type: multi crystal silicon. b. Voltage: 4V. c. Current: 15mA. (2) Battery: a. Type: lithium rechargeable. b. Voltage: 3V. c. Capacity: 50mAh. 2. Mechanical: (1) Construction: polycarbonate. (2) Diameter: Φ50mm x 25mm. 3. Reliability: operating temperature -20℃ to 60℃. 5. LED color: red, yellow, blue, green and white.